Stapling is the process of combining coupons, rewards, and credit card bonuses, on purchases made at Staples. The purpose of Stapling is twofold: to make money and to get free stuff. Staples is very generous when it comes to coupons. Every week they release new ones on their website that range from 30% off binders to 20% off your entire purchase. There is usually at least one FAR (free after rebate) item every week as well. They also offer other coupons, such as $25 off a $75 purchase or $10 off a $50 purchase. The best use of coupons is when you stack them. All the coupons they release usually say something like “not valid with any other coupon,” however, as long as the cashier lets you, the POS system will accept it. You cannot use two dollar off coupons on the same order, but you can stack a dollar off coupon and a percentage off coupon. This last week I stacked a 20% off my total purchase and a $10 off $50 purchase at Staples. 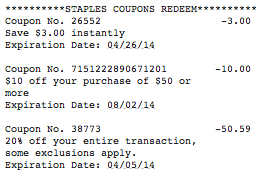 You can get a $10 off $50 coupon by signing up for Staples’ email deals. It usually takes about 24-48 hours to receive the coupon. You can sign up for a Staples Rewards account here. This is another great feature provided by Staples. 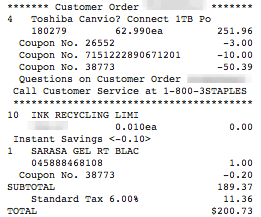 If you have a base account (under $499 spent in a year), then you can recycle 10 ink cartridges a month at $2 each. If you have a plus or premier account, you can recycle 20 ink cartridges a month. If you don’t have a business, it is likely you do not have that many cartridges to recycle a month. Fortunately, you can find empty cartridges on eBay for $0.05-$0.10 each. 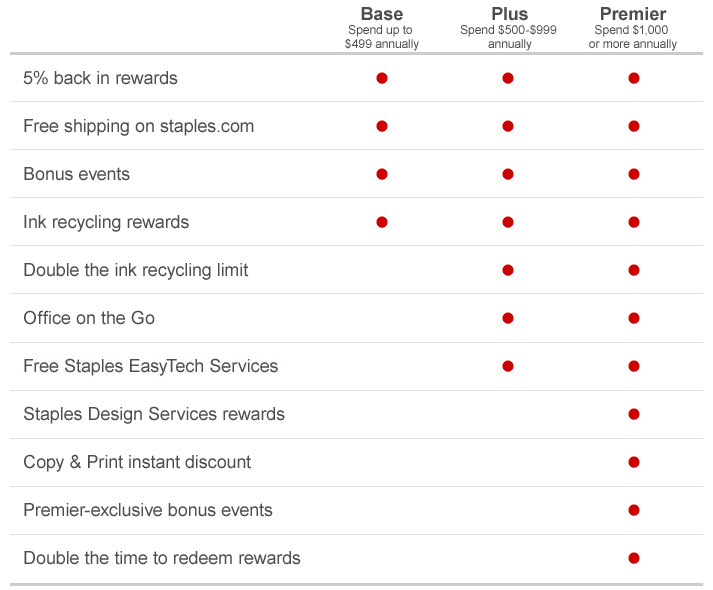 As a side note, you need to spend $30 on ink at Staples every 180 days to use this perk. Real world example: Let’s say you have a plus account and Staples (20 ink recycles per month). You don’t need ink, so you purchase a $35 ink cartridge that you sell on eBay for $28. You also don’t have ink cartridges to recycle, so you purchase 100 cartridges on eBay for $20 ($0.05 each). As you can see, ink cartridge recycling can be very profitable with very little work. The things you buy at Staples, not only earn 5% back via Staples Rewards, but also credit card rewards. The best card for Staples is the Chase Ink Bold and Plus since you earn 5X UR points on all office supply store purchases. To increase your profits even more, you can sign up for Visa SavingsEdge where you can get 1% cash back on all your Staples purchases that are over $200! On top of that profit I sold each hard drive for $65 (~$57.50 after fees). So, I made $30 from reselling the hard drives. If you want to learn more about Stapling, check out this thread. That thread is the ultimate Stapling information thread, so definitely check it out. Stapling is very YMMV, so your experience will completely depend on your store’s cashiers.